This is a 15-question, 3-hour examination. All answers are integers ranging from to , inclusive. Your score will be the number of correct answers; i.e., there is neither partial credit nor a penalty for wrong answers. No aids other than scratch paper, graph paper, ruler, compass, and protractor are permitted. In particular, calculators and computers are not permitted. Let be the number of ordered pairs of integers with and such that the polynomial can be factored into the product of two (not necessarily distinct) linear factors with integer coefficients. Find the remainder when is divided by . The number can be written in base as , can be written in base as , and can be written in base as , where . Find the base- representation of . Kathy has red cards and green cards. She shuffles the cards and lays out of the cards in a row in a random order. She will be happy if and only if all the red cards laid out are adjacent and all the green cards laid out are adjacent. For example, card orders RRGGG, GGGGR, or RRRRR will make Kathy happy, but RRRGR will not. The probability that Kathy will be happy is , where and are relatively prime positive integers. Find . In and . Point lies strictly between and on and point lies strictly between and on so that . Then can be expressed in the form , where and are relatively prime positive integers. Find . For each ordered pair of real numbers satisfying there is a real number such that Find the product of all possible values of . Let be the number of complex numbers with the properties that and is a real number. Find the remainder when is divided by . A right hexagonal prism has height . The bases are regular hexagons with side length . Any of the vertices determine a triangle. Find the number of these triangles that are isosceles (including equilateral triangles). Let be an equiangular hexagon such that , and . Denote the diameter of the largest circle that fits inside the hexagon. Find . Find the number of four-element subsets of with the property that two distinct elements of a subset have a sum of , and two distinct elements of a subset have a sum of . For example, and are two such subsets. The wheel shown below consists of two circles and five spokes, with a label at each point where a spoke meets a circle. A bug walks along the wheel, starting at point . At every step of the process, the bug walks from one labeled point to an adjacent labeled point. 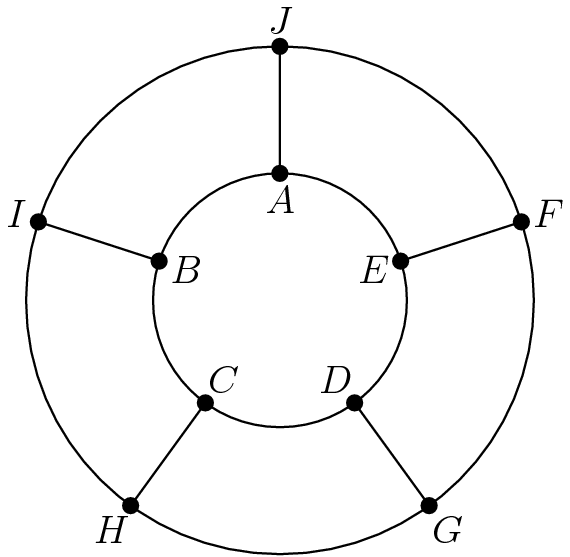 Along the inner circle the bug only walks in a counterclockwise direction, and along the outer circle the bug only walks in a clockwise direction. For example, the bug could travel along the path , which has steps. Let be the number of paths with steps that begin and end at point Find the remainder when is divided by . Find the least positive integer such that when is written in base , its two right-most digits in base are . For every subset of , let be the sum of the elements of , with defined to be . If is chosen at random among all subsets of , the probability that is divisible by is , where and are relatively prime positive integers. Find . Let have side lengths , , and . Point lies in the interior of , and points and are the incenters of and , respectively. Find the minimum possible area of as varies along . Let be a heptagon. A frog starts jumping at vertex . From any vertex of the heptagon except , the frog may jump to either of the two adjacent vertices. When it reaches vertex , the frog stops and stays there. Find the number of distinct sequences of jumps of no more than jumps that end at . David found four sticks of different lengths that can be used to form three non-congruent convex cyclic quadrilaterals, , which can each be inscribed in a circle with radius . Let denote the measure of the acute angle made by the diagonals of quadrilateral , and define and similarly. Suppose that , , and . All three quadrilaterals have the same area , which can be written in the form , where and are relatively prime positive integers. Find .